(Photo: REUTERS / Philimon Bulawayo)Zimbabwe President Robert Mugabe speaks at the opening of the ZANU-PF annual People's Conference in Chinhoyi, north-west of Harare December 13, 2013. Mugabe said on Friday members of his party would choose his eventual replacement, but gave no timeline despite a mounting succession battle triggered by long-denied reports he is suffering from cancer. 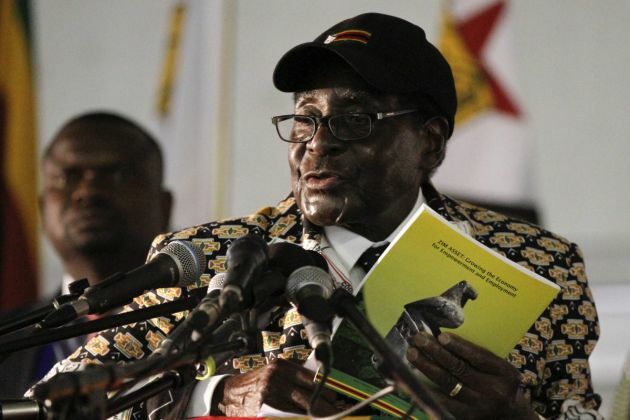 Some Zimbabwean churches are calling for the impeachment of its 92-year-old President Robert Mugabe due to misrule that has resulted in the economic collapse that has triggered civil unrest. The coalition of churches, which include Zimbabwe Divine Destiny, Zimbabwe Christian Alliance, Christian Voice, Zimbabwe Pastors' Fellowship and Prayer Network Zimbabwe, as they call for protests in the capital Harare. The coalition said in a statement it would demand that Mugabe's government be held accountable for failing to deal with multiple economic crises. Mugabe and his Zanu-PF party have ruled the country since it gained independence from Britain following a bitter war against white settlers in the country who had seized illegal independence. The churches said they would also protest against the abuse of State security apparatus, abductions, vote rigging and illegal arrest of citizens, ANA-CAJ reported. Violent protests against Mugabe's rule are a regular occurrence, with demonstrators uniting around #ThisFlag on social media to condemn high unemployment, acute cash shortages and corruption, The Africa Report said. Zanu-PF remains united, but ambitious factions within the party are plotting to control the post-Mugabe era. Religious leaders are at the forefront of Zimbabwe's protest movement. Pastor Evan Mawarire, who started the hashtag after a series of popular YouTube videos, fled to South Africa last month in fear of reprisals from government security forces. Police used tear gas, water cannons and batons on Aug. 24 to disperse a youth-led protest in Harare against police brutality. Home Affairs minister, Ignatius Chombo was quick to condemn the mayhem, saying that those caught on the wrong side of the law will live to regret. "[Morgan] Tsvangirai and his Movement for Democratic Change (MDC-T) party are to blame for all [the destruction]", Chombo said. On Aug. 26, 200,000 demonstrators are expected to take to the streets of Harare to protest Mugabe's rule. Tsvangirai, who is the former prime minister and now leads the MDC-T party, and former vice president Joice Mujuru are involved in the protests said Africa Report. After Friday's demonstration, church members plan to petition Parliament to impeach Mugabe. Bishop Ancelimo Magaya, speaking on behalf of the churches, demanded Mugabe's government acknowledged Zimbabwe was in a dire situation that required "an extraordinary collective response". "Failure of which, the church demands Parliament to move a motion of impeachment of the President over failed governance and subsequently set up a transitional authority to handle the crises and carry the nation through until the next election," said Magaya. Mugabe, who was raised a Catholic, has previously quashed criticism from church leaders. Last month he castigated popular pastor Evan Mawarire as a false preacher sponsored by foreign countries bent on destabilizing Zimbabwe. On July 6, Zimbabweans heeded a "national stay away" called for by Mawarire who used his social media #ThisFlag campaign to mobilize citizens. Mawarire has since fled Zimbabwe. Mugabe has also previously called retired Roman Catholic Archbishop of Bulawayo Pius Ncube, who was an outspoken critic of his rule, a half-wit and a liar.